This week is the 97th Anniversary of the Battle of Loos, not only the first major British offensive on the Western Front but the first British use of gas and the first time on the Western Front entire formations of Kitchener’s Army men – the willing volunteers of 1914 – fought in a major battle. All this week Great War Photos will feature images connected with the battle. 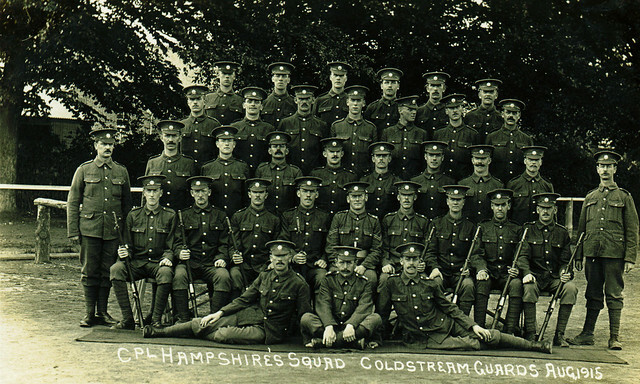 We start with this group photograph of men of the Coldstream Guards in August 1915. Taken only a few weeks before the Battle of Loos it shows men of a Guards training platoon at their end of their course awaiting posting to the front. Up until this time the different battalions of the Guards had been posted across the British Expeditionary Force but a decision had been made to bring them all together under a unified command into what became the Guards Division. The units of the division – many of whom had been in action continuously since Mons in 1914 – were brought together that summer and assembled for the next offensive; although they would not play their part in the vanguard of the Battle of Loos but in fighting for locations like the Hohenzollern Redoubt. Weeks of physical drill, bayonet practice, shooting on the range and training in all the new accoutrements of trench warfare had steeled these men in this photograph for the front. Within a month they were at the base being posted as re-enforcements to the Coldstream battalions in the Guards Division and then thrown straight into battle at Loos. As Guardsmen they gained a high reputation, which would see their regiment and the Guards Division at the forefront of engagements until the end of the conflict. This entry was posted on 24/09/2012 by sommecourt. It was filed under British Army, France, Great War, Loos 1915, Western Front, WW1 and was tagged with 1915, Coldstream Guards, Guards, Loos.